These days our family is trying to be more health conscious. I just had a baby 5 months ago, and my husband and boys are going to the Grand Canyon for a male bonding hike. Though we generally cook pretty healthy, I have been modifying my recipes by adding less oil and planning meals with a lot more veggies. My boys love Chinese food so I thought I would give them a treat. Although I am having a hard time convincing my teenage boys that brown rice is better, my husband finally came aboard the brown rice train after much complaints. I served it with his favorite Pakistani lentil dish, Daal Masala and once he put it in his mouth he announced that it tasted pretty much the same. Triumph! 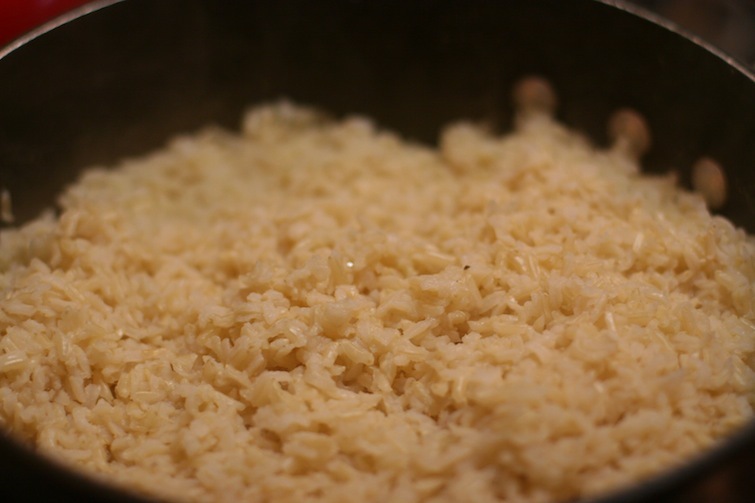 I think it is just a mental block and once you get over it, I find the brown rice to be much more satisfying both in taste and a sense of fullness. Paired with Kung Pao Chicken and Broccoli with Mushrooms, you’ll never miss that greasy take-out from the local Chinese restaurant. I replaced the beef with mushrooms. It is a great way to fool your palette because mushrooms have a slight meaty flavor and chewy texture. In a nonstick wok, heat the oil on high heat, add the garlic and ginger and stir for a few seconds, now add the mushrooms and sauté on high heat for about a minute. Next add the broccoli florets and toss to combine. Add the oyster sauce, rice wine, and the ¼ cup water. 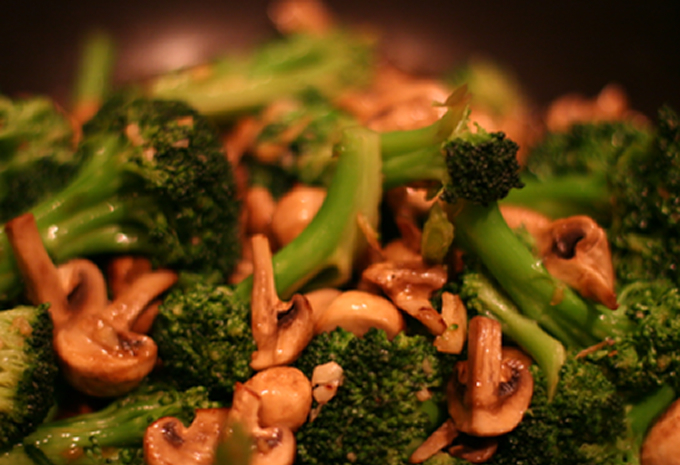 Cover and simmer on low heat for 3-5 minuets or until the broccoli is done to your desire. I like mine a bit crunchy. While the broccoli is cooking, in a small bowl mix the 1 tablespoon of water and tapioca starch together. When the broccoli is done drizzle the tapioca starch mixture around the edges of the pan, raise the cooking temperature up to medium-high and toss to coat, add the sesame oil, continue tossing the mixture until the sauce is thickened slightly and coats the ingredients. Serving this dish in a platter rather than a bowl prevents the broccoli from further cooking as it sits. 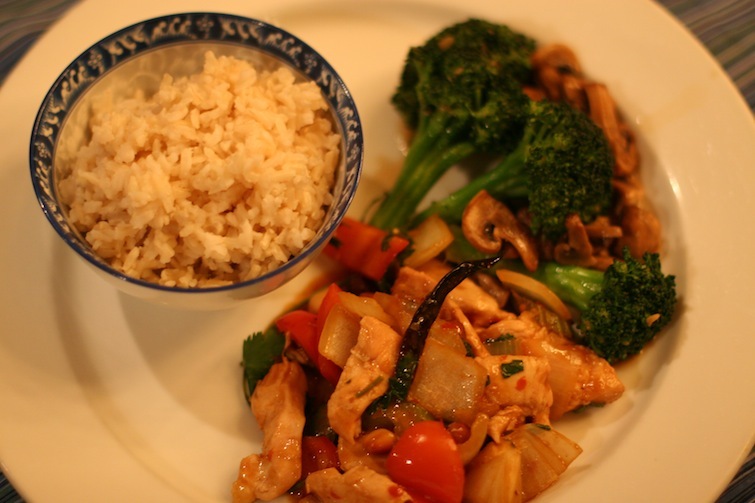 I love to use tapioca starch opposed to cornstarch to thicken my stir-fry. I was introduced to it while learning Thai cuisine. I find the sauce has a better body and a not so slimy finish that cornstarch sometime produces. You can find it at your local Asian Market. For the sauce, in a small mixing bowl add the first 6 ingredients, stir together and set aside. In a nonstick wok, heat 1 tablespoon of the oil, add the garlic and ginger and sauté on high heat for a minute, then add the chicken. Cook the chicken until it is just done. Reserve it in a bowl. Now add 1 tablespoon of oil and sauté the onion, bell pepper, zucchini, and celery. 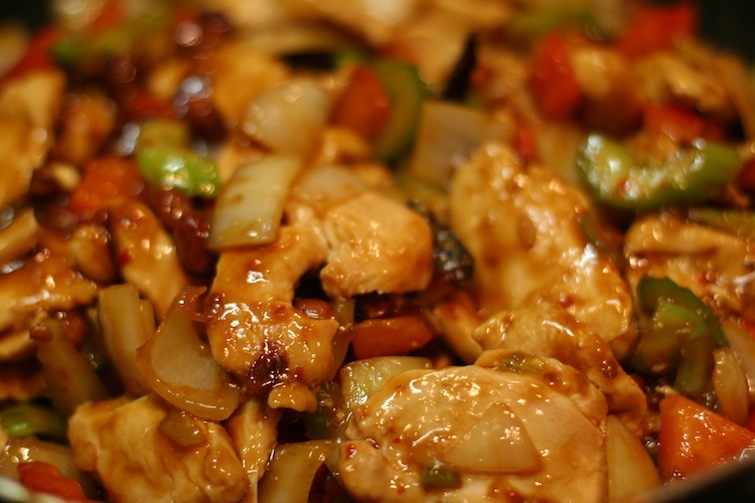 Cook until the vegetables are just tender and then reserve with the chicken. Now clean the wok with a rinse of water and a wipe, adding the last 1-tablespoon of oil and on high heat add the serrano chili, garlic, peanuts, and dried red chilies. Cook, shaking the pan, until the peanuts just start to brown then add the reserved chicken and vegetables and toss to combine. Continuing at high heat, add the sauce that was set aside and continue to toss, cooking until your sauce starts to thicken, about 1 minute. Serve on a platter, garnish with cilantro leaves.